A lot of people think that ceiling fans are simply functional, and that they are not overly attractive. You might be surprised to learn that not only are there many beautiful ceiling fans available, but also that many are made with elegant crystal, and have the look of crystal chandeliers. These ceiling fans are obviously going to cost you a lot more than a traditional ceiling fan with plain blades and no fancy lighting, but if you want this kind of elegance, it is definitely worth it, especially when you consider that using ceiling fans can help you save money on your home heating bills, which offsets the initial cost. Today, we are going to review some of the best, most elegant ceiling fans with crystals so you will have a good idea of what is available. This elegant ceiling fan from Parklake has a brushed nickel finish with chocolate finish blades, and it comes with a crystal light kit that gives it that added touch of elegance, and fills the room with beautiful sparkle and shine. This is the ideal ceiling fan for your living room, or any room where you are going to be entertaining. Bulbs – A lot of chandeliers, ceiling fans, and other lighting fixtures do not come with bulbs, so you have to spend more money. This fan comes with the bulbs for the crystal light kit, so you can put everything together and start using the fan and light right away. Installation may require an electrician if you are not experienced. Three Speeds – This ceiling fan has a three-speed setting that is easy to use, and it is easy to get to and maintain your perfect comfort level. You don’t even have to pull a chain, because it comes with a remote control. Reverse Air Flow – You have the option to have a nice, cooling breeze, or you can reverse the direction so the warmer air is evenly distributed throughout the room. This is going to help keep your cooling and heating bills lower. Energy Efficient – When you use this ceiling fan, you can save a lot of money on your cooling and heating bills. It will help keep air cool in the summer, and the reverse action will help to lower the warm air in the winter and keep it circulating around you so you don’t have to turn up the heat. Durability – This ceiling fan is built to last for a lifetime. It is made from durable materials, and has a powerful yet quiet motor. The LED lighting is energy efficient, so this is another way that this ceiling fan is going to save you money in the long run. Dust Repelling Blades – The blades are coated with the Hunter patented Dust Armor nanotechnology. This keeps dust from building up on the blades, so you don’t have to clean them all the time. None – We have found no bad reviews from customers about this product, so we assume that users are happy with it. The Parrot Uncle ceiling fan has a modern appearance, and includes lights and a crystal chandelier. This is a crystal chandelier ceiling fan combo. This is an attractive ceiling fan that is going to look amazing in your dining room, or in a large foyer. It comes with a nine-bulb light kit, UL listed and 32-watts. The lights are replaceable, but they are not dimmable. There are four retractable acrylic fan blades that have a full span of 52.5 inches when extended, and 21 inches when closed. Remote Control – The fan speed, as well as the light, can be controlled with the remote control. There is an Off, high, mid, low switch for the fan speed, and an on/off switch for the light, so you can control the fan from anywhere in the room. Angled Ceilings – This ceiling fan can be mounted on an angled ceiling. An angle mounting is available (smaller than 15 degrees). Two down-rods are included, one four inches and one 10 inches in length. Save Energy – This is an energy saving device that is a must-have for your home. By providing you with cooler air in the summer and warmer air in the winter, it is going to help keep your home heating costs down. It is also going to help keep the air in your home circulated and fresh. Appearance – This “fandelier” as many people call this type of lighted ceiling fan is one of the most attractive ceiling fan and chandelier combinations you will find. It has nine lights that are not dimmable yet they are soft, creating a lovely ambience in any room. Quality Materials – This ceiling fan is made with high-quality materials that are not going to warp, rust, etc. The blades are made from silicon steel, and motor is both quiet and powerful, yet energy-efficient. Installation – Some users report that installing this ceiling fan can be a pain, because you have to attach each crystal ball to a chain, and then attach each chain to the chandelier itself. They found this to be far too time-consuming, but we think that the end result is well worth the time. The Whse of Tiffany CFL-8111 Catalina ceiling fan has three lights and five blades, and is an elegant addition to any room. It has a 48-inch overall blade span. 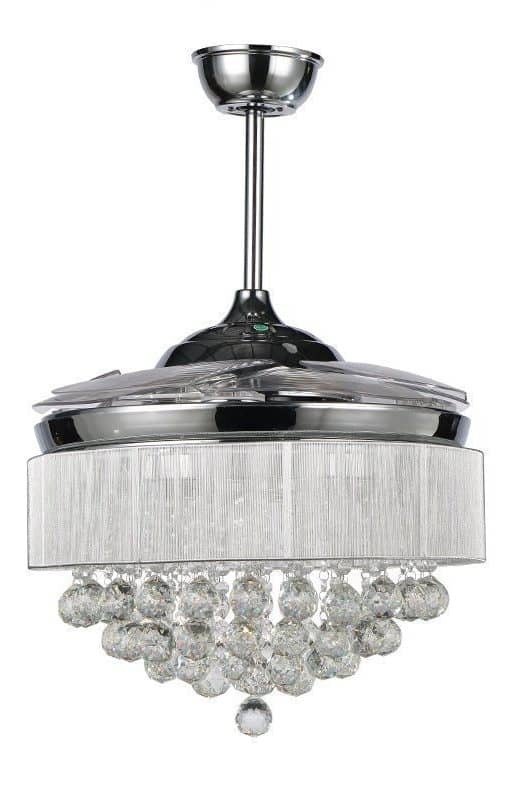 If bling ceiling fans are your thing, the crystals give it just the right amount of bling to make it look beautiful. The lighting does require three 60-watt Type B bulbs, which are not included. Down-Rod – This ceiling fan is relatively easy to install, and it comes with a four-inch down-rod. Some people do prefer to use it with a 12-inch down-rod, but this must be purchased separately. Most people find that the included down-rod is perfectly fine for their needs. Appearance – This is one of the more attractive ceiling fans you can get, and the crystals set off the bronze finished blades perfectly. It can go from looking functional to looking elegant in seconds, simply by switching on the lights. Size – This is smaller than many other ceiling fans you can get, but if you don’t have a large space and still want better air circulation and a chandelier, this is definitely a good option for you to consider. Elegance – Most people who have this ceiling fan say that they love the appearance, and that it adds a lot of elegance to any room it is installed in. They did note that there is lacing behind the crystals, but this is nearly invisible with the light on. Metal Blades – Many people find that wooden ceiling blades just don’t hold up, and they need to replace their ceiling fans, or at least the blades. These blades are made of metal, so they are not going to break easily. Short Blades – Some users have reported that they do not like the shorter blades, because they do not provide enough air circulation. They like the fan otherwise, but would be happier if it had longer blades. 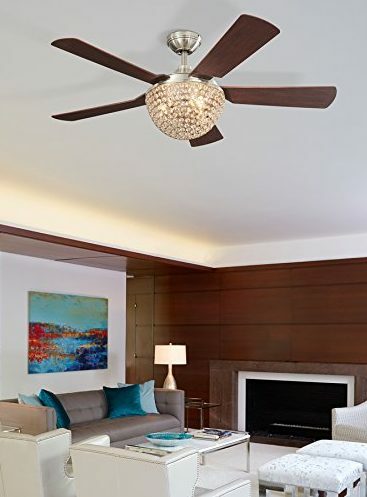 The Casa Optima is a brushed steel and crystal ceiling fan that has a 52-inch blade span with a 14-degree blade pitch. The canopy is 5 ¼ inches wide, and 3 ¼ inches high. This fan has a reversible, three-speed motor in brushed steel, and there are five attractive blades with a silver finish. It also has a chrome-finish light kit that uses four 20-watt G4 halogen dimmable bulbs, which are included. Light Kit – This fan comes with a chrome finish light kit that has beautiful crystal strands, along with a clear glass drum. It provides just the right amount of light, and if you want a softer ambiance, you can dim the lighting. Four bulbs are included, so you can set the fan and light up and start using it right away without having to run to the store for bulbs. Motor – The motor has three speeds, and it is reversible. You can use it in the summer to push cooler air down, and in the winter to move around warm air so it circulates throughout the room, allowing you to stay warm and still turn the heat down. Quiet Operation – Unlike many other ceiling fans, this one has a very quiet operation. You may hear the whooshing of the blades through the air once in a while, but there is no annoying hum coming from the motor. Energy Efficient – Most users love that this is a very energy-efficient fan that not only doesn’t use a lot of electricity, but that can also help them to save money on their home heating and cooling bills. Appearance – There is nothing negative that anyone can say about how great this ceiling fan/chandelier looks. 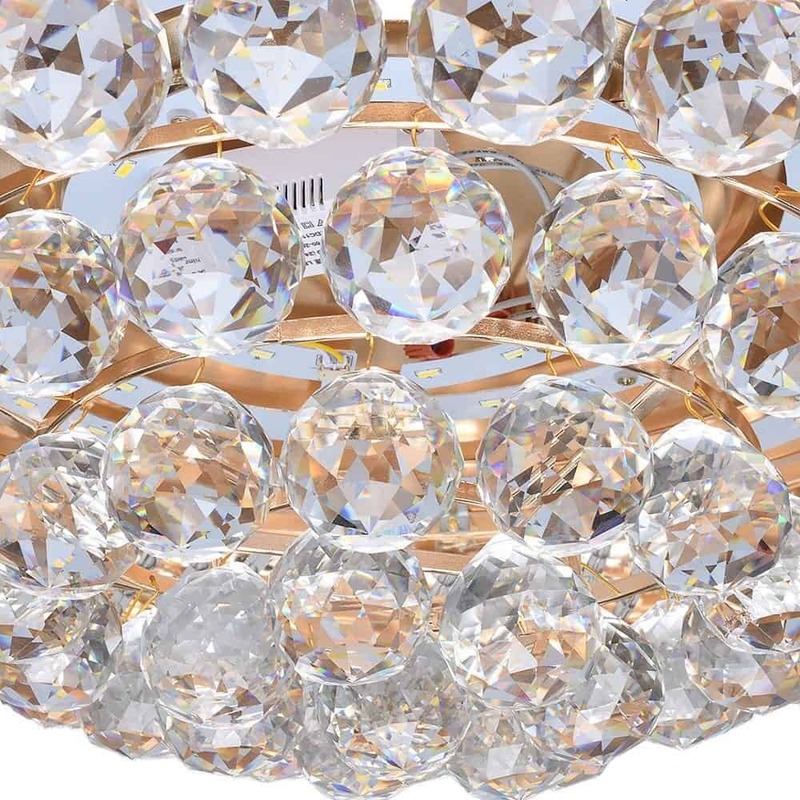 The sparkling chrome, when combined with the crystal, gives it a modern yet elegant look. None – We have found no bad reviews about this product, and assume that customers are generally happy with it. 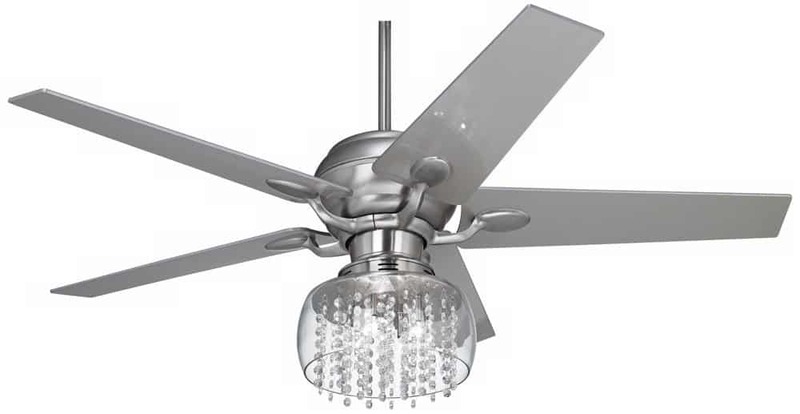 The CORORLED Modern Crystal ceiling fan/chandelier is as unique in appearance as it is functional. It has beautiful, transparent acrylic blades that span 42 inches, and they are retractable, so they are only at full length when in operation. This ceiling fan has a modern yet elegant look that you are going to love in your home. If you are looking for fancy ceiling fans with crystals, you have to add this one to your list of options. Three Speeds – This is a dual use ceiling fan with three speeds, and is ideal for both summer and winter use. Enjoy low, medium, or high speeds, or turn the fan off and just enjoy the beautiful lights and crystals. Quiet – There are no humming noises coming from the motor of this ceiling fan. It is not going to be distracting during conversation, nor will it be annoying if you keep the fan on while you are sleeping. Transparent Blades – The blades are made from transparent acrylic, so they aren’t going to be overpowering in appearance against the crystals. Everyone is going to notice the chandelier before they notice the blades. Adjustable Air Circulation – This ceiling fan provides plenty of air circulation in any room that it is installed in. Enjoy cooling breezes in the summer, and let it circulate warmer air downwards in the winter time. Guarantee – There is a one-year guarantee for replacements if there are any defects in the materials or workmanship, but it is unlikely that you will find any problems with this attractive ceiling fan. None – We are unable to find any negative reviews about this ceiling fan/chandelier, so we assume that customers enjoy using it. There are many things to consider before buying a new ceiling fan for your home. One of the most important considerations is the ceiling height in the room you plan to have it installed in. You need to consider the down-rod size against the ceiling height. For instance, a nine-foot ceiling needs a fan with a six-inch down-rod. Another thing you need to think about is the mounting options. Do you want a ceiling fan with a flush mount, or one that has a down-rod mount? If you have low ceilings, a flush mount is the better option. Down-rod mounts are more suited for higher ceilings. You also have to look at the ceiling fan blades. There is a lot more to them than just their appearance. For instance, the pitch of the blades has a lot to do with how the airflow is controlled. Another consideration is the amount of blades on the fan. Some have only three blades, while others have as many as nine blades. Most people choose a classic four or five-blade fan. Finally, you need to think about where the fan is going to be, because the style has to fit in with the room’s décor. Ceiling fans come in several different styles and designs. You can choose to have one with or without lights, or, like the ones we have talked about today, a chandelier style that is a lot more elegant than the traditional ceiling fans most of us are used to. It is relatively easy to install a ceiling fan. However, if you do not have a lot of experience working around electricity, it is best to leave this job in the hands of a professional, licensed electrician. It may cost a little bit more, but it is a lot safer, and worth it in the long run. 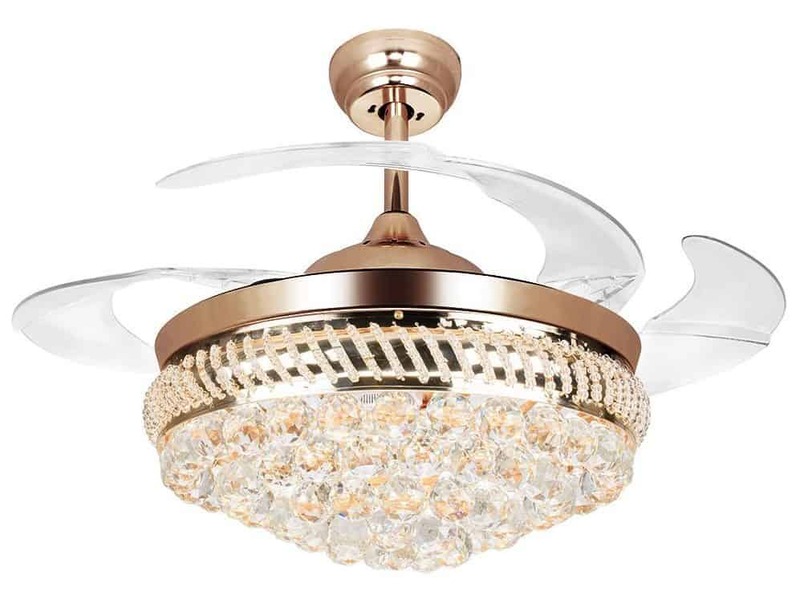 If you would love to have a ceiling fan, but you find them too modern looking, take a look at some of these beautiful crystal chandelier ceiling fans. They offer functionality, along with a touch of elegance, and they are all made with quality materials. No matter what type of décor you have in your home, one of these ceiling fans is sure to look wonderful. Having one of these fans will look great, and it will help you to have better air circulation throughout your home.